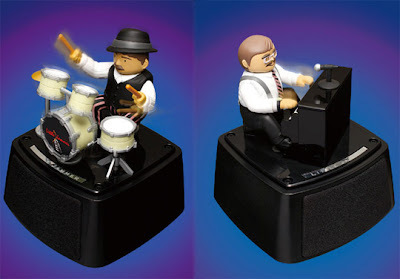 SPECTREOUTREACH.com: MY OWN LITTLE DEMON BAND ! MY OWN LITTLE DEMON BAND ! I prefer the Demon Dude on the left, I C4 the right one into Ash! 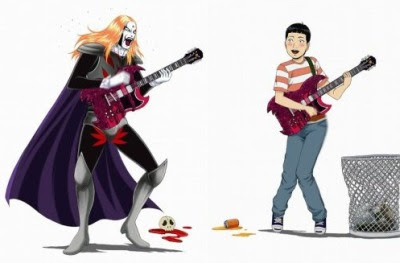 As a kid , I have a weird dream of forming my very own death metal band. Only one problem, the song or the word that come out of my mouth is mostly in form of swearing or screaming for blood and smashing thing left and right.I wonder why? Anyrate, I probably scare off any potential band member so the idea was just a fleeting dream until I spot something interesting when airborning over Japan Trend Shop recently! • 25 title ROM cartridge with songs like: The river of no return, Come together, Diamond head, In the mood, Take five, Girl from Ipanema, and more! • Bonus 25 title Pop Music cartridge with songs including: Bohemian Rhapsody, the Star Wars theme, and selections from J-Pop artists like Tokyo Ska Paradise Orchestra, Kazumasa Oda, and more. Move away IPOD DOCKER system ! We rocking this joint Now! Hold on a minute! 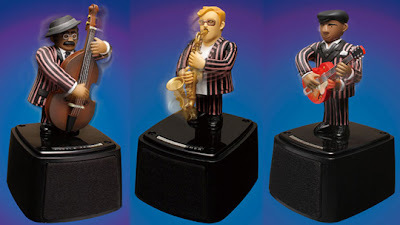 this little band can really spice your home and atmosphere (if you getting tired with that dull sound box of yours) by providing that 3D sound with own automatic action that mimic the J-Pop music that is currently playing. Small is X'traordinary! *Note: PRESS THIS LINK to see them in action! Satsugai ! Satsugai ! Satsugai! I am the terrorist from Hell!